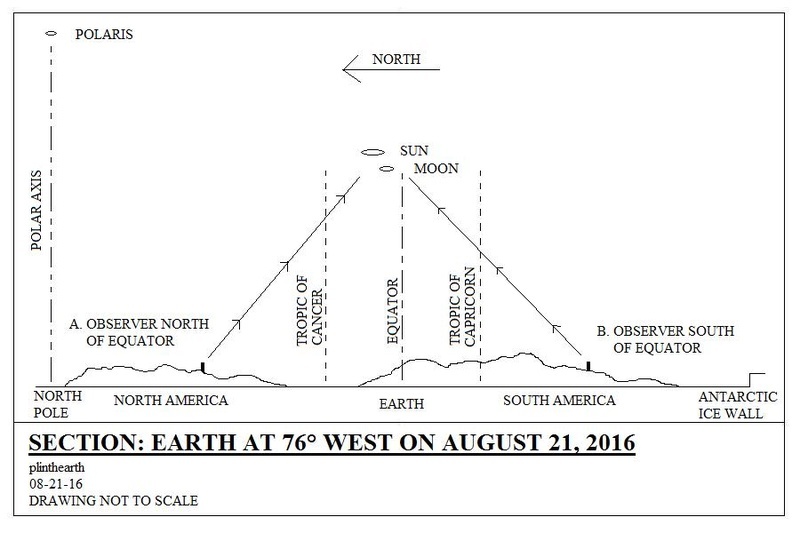 Can any fellow IFERS member who either lives or has traveled south of the Equator please verify that the Sun and Moon are definitely observed to travel from right (east) to left (west) through the northern sky? Definitely travelling east-west down here in Southern Australia. As you stated, in Southern Australia you observe the Sun and Moon traveling east to west, as everyone in the world does. What I really need to know is whether east is on your right hand side while facing north (observer supposedly located south of equator) or east is on your left hand side while facing south (observer supposedly located north of equator). Hopefully these two drawings will clarify the question that I am asking to all IFERS members regardless of latitude or longitude. 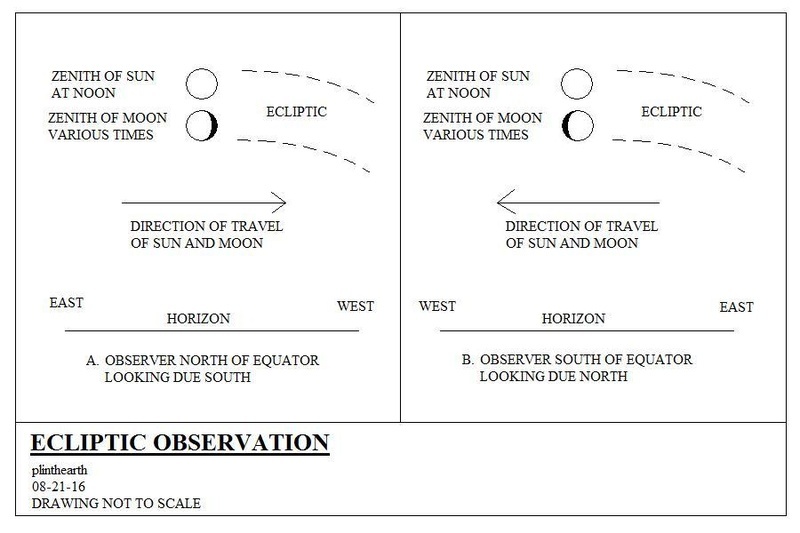 Do observers located south of the equator view the Sun and Moon while looking north with the direction of travel of the Sun and Moon from east (right hand side) to west (left hand side)? If I stand on the beach and face north - the sun moves from my right (east), to my left (west). If I face the sun as it's setting, it appears to sweep to the right (north) as it sets. Now that spring is almost here I will organise a time to capture some time lapse footage for the record. I could do some too. @csp. did you feel similarly matey, less chemtrails? When you view the full Moon near its zenith, does the flat face of the Moon appear to you to be parallel to the flat Earth, perpendicular to the flat Earth (like a clock on a wall) or at some angle in between? Time lapse imagery of the Moon from Australia would be fantastic to see and add significantly to our knowledge of the Moon. All recorded astronomical observations of the Moon (time lapse, video, photo, hand drawn sketch, handwritten note, etc) from any latitude or longitude are extremely valuable to post modern flat earth astronomy. Please contribute any verifiable information regarding the Moon in this topic. thesilentone wrote: I could do some too. Yes, definitely less, but that seems like normal procedure during winter from my own personal observations. I bet once summer comes around, they'll be in full force as usual! plinthearth wrote: When you view the full Moon near its zenith, does the flat face of the Moon appear to you to be parallel to the flat Earth, perpendicular to the flat Earth (like a clock on a wall) or at some angle in between? I can't say for certain, I'll have to observe the next full moon, but from memory I'd say it's somewhere in between. Youre probably right though last winter iirc there was still plenty more trailing. I keep hoping/thinking maybe the budget is drying up! Yes I also do believe the moon appears to be somewhere in between. In the drawing "Moon Orientation Observation" I present three cases describing the possible orientation of the flat Moon to the flat Earth. 1. Observers north of the equator view the Moon in the southern sky traveling from left (east) to right (west), while observers south of the equator view the Moon in the northern sky traveling from right (east) to left (west). 2. Observers everywhere on Earth always see the same face of the Moon, though the angle of rotation varies depending on the observer's location. This is the orientation the Moon that most people remember observing without actually looking at the Moon. This orientation could only work if the lower portion of the Moon acts like a reflective prism projecting the same face of the Moon to observers north and south of the equator, and directly at the equator. This is the orientation of the Moon that most people claim to observe while actually looking at the Moon. This orientation could only work if the Moon is like a piece of glass that can be viewed from both sides with the lower portion of the Moon acting like a reflective prism that projects the face of the Moon to observers directly at the equator. In my opinion, the flat Moon is parallel to the flat Earth. 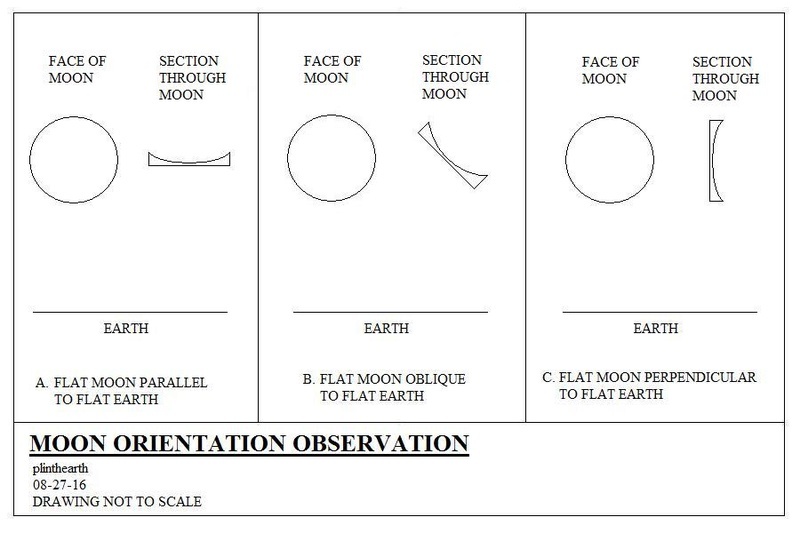 This is the only orientation that works to describe all observable facts about the Moon. The Moon appearing to be oblique or perpendicular to the Earth must therefore be an optical illusion due to the immense size of the Moon in relation to its close proximity to the Earth. An oblique or perpendicular Moon would require the lower portion of the Moon to act like a reflective prism, an extremely complicated solution to reconcile observable facts. I agree, it is most definitely picture A and not B or C as we would not see a full-moon as a full-circle otherwise, and B and C would allow some observers to see different faces/aspects/shape of the Moon than what we actually see. Admin wrote: I agree, it is most definitely picture A and not B or C as we would not see a full-moon as a full-circle otherwise, and B and C would allow some observers to see different faces/aspects/shape of the Moon than what we actually see. I also concur, most definitely has to be A from what we observe. We could apply the same logic to the sun if we get several observers from different locations to take some filtered images - we can then match the small features of the suns surface and perhaps come to the same conclusions with definitive proof to boot. Plinthearth, what are your thoughts on eclipses and their causes? I just found interesting link, could be helpful in explaining some of that topic. Vidoe has been added on 28th August 2016. The moon and sun appear to flip at their zenith viewed from the equator but viewed from north of the equator, the sun and moon both rotate. A little confused by the information presented in this video - those viewing from north of the equator see it rotating clockwise, and those from south of the equator, anti-clockwise. So if we are on a flat plane, and these luminaries are parallel to the earth while moving around the north pole going east to west, would logic not suggest those viewing it from any position should see it rotating in a single direction? Or am I completely missing something here? I am currently investigating the possibility that observers north of the equator can see slightly more of one side of the Moon's circumference than observers south of the equator, and vice versa. Before this can be determined, the purported rotation of the Moon about its polar axis as it crosses the sky must be examined and explained. Personally, from my vantage point in Pennsylvania (41° N, 76° W) I have never observed the rotation of the Moon about its polar axis. I have always seen the same features of the full Moon's face in the same orientation. It always looks like a smiling face to me. The video posted by Real World shows evidence to the contrary: that the Moon appears to rotate about its polar axis as it crosses the sky. If this visual effect is observable only north or south of the equator, but not at the equator, it seems likely to me that the angle of the Moon's face always remains the same in relation to Polaris, like a pendulum with the Moon being the weight and Polaris being the center of rotation. This would create a visual effect to stationary observers that the Moon is rotating about its polar axis as it approaches and recedes. In other words, if we could follow the Moon's path across the sky in an airplane at the same latitude on a given night, the Moon would not appear to rotate. More data is needed. 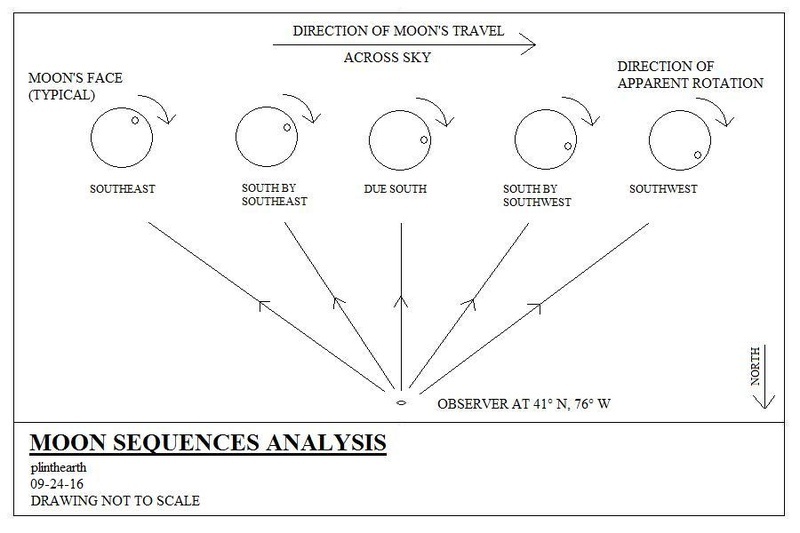 Once the relationship between the angle of the face of the Moon and Polaris has been determined, high definition photos of the Moon taken on the same night at the same time by two observers along the same longitude but at opposite north/south latitudes must be carefully analyzed to detect if there is even the slightest amount of difference between observable features at the Moon's circumference. If there is a difference, then the conclusion would be that the face of the flat Moon is either slightly convex or slightly concave, like the two sides of a frisbee or a saucer, depending on the results of the analysis. I must commend you for recommending the idea of applying the principle of comparing photos from different vantage points to determine slight differences in the appearances of the celestial bodies. In order to produce valid data, we would need pairs of observers along given longitudes at opposite north/south latitudes. Eclipses depend entirely on the cosmology of the flat Earth system, specifically the elevations of the Sun, the Moon and the Stars in relation to each other and the flat Earth. Based on my observations of the heavens, the Moon is at a lower elevation that the Sun, making solar eclipses simply what they appear to be: the Moon blocks the light emanating from the Sun and observers in the shadow on Earth see either partial or complete eclipses of the Sun. 1. If, as modern science posits, the Stars are at a higher elevation than the Sun, then lunar eclipses may be the result of sunlight reflecting off large bodies of water and striking the obverse face of the Moon, causing the color of the visible Moon to change. Lunar eclipses are caused by the light of the Sun passing through a Star, changing the wavelength of the sunlight, and then striking the reverse face of the Moon. Instead of completely negating the Moon's self-illuminating property, like typical sunlight, the altered sunlight that has passed through the Star is only capable of altering the color of the self-illuminated visible obverse face of the Moon. Please keep in mind that these are mere hypotheses about eclipses, and that much more research and analysis needs to done. The first part of the video showing the full Moon at the equator was well done, informative and illustrative of three-dimensional camera tricks. 1. The images look like they were taken with different cameras. 2. No information was given describing the exact latitude/longitude of the observer, the direction of the sky the images were taken in and the dates/times that the images were taken. 3. No reference point was shown in the video to prove that the Moon actually appeared to be rotating in reference to the Earth, as opposed to the camera or images being rotated to produce the visual effect. I spent some time trying to watch the Moon last night, I couldn't see any rotational movement over the course of a few hours - however the cloud cover was quite heavy so the moon was dropping in and out of visiblity for me. I'll do some more observing over the next few weeks and endeavor to finally buy a decent camera, I'm located in South Australia (34° S, 138° E) for the record. Phuket World has posted another video with a demonstration using a ceiling fan, explaining the perceived rotation etc. The second video illustrating the purported rotation of the Moon about its polar axis shows exactly what I would expect to see if the angle of the Moon's face is constant relative to Polaris (like the circle on the fan blade). As the Moon (traveling east to west) approaches and recedes from a stationary observer on Earth, it would appear to rotate counter-clockwise, regardless of whether the observer is north or south of the equator. If the Moon revolved from west to east over the flat Earth, then the apparent rotation would be clockwise. If this is actually true, then the Moon's face is indeed slowly rotating counterclockwise (as viewed from Earth) about its polar axis as it revolves around the Earth, in order to maintain the angle of its face relative to Polaris. This would result in observers at various longitudes on the Earth seeing the exact same orientation of the features on the face of the Moon relative to Polaris, depending on their locations north or south of the equator. Neither of these videos, however, actually prove that this is the case. What we really need to know is whether observers at different longitudes do or don't see the same orientation of the features on face of the Moon relative to Polaris. This will require multiple verified observations and/or photographs from various longitudes on Earth, not simply a single observation by a single observer at one location. This process needs to be performed both north and south of the equator. A second possible scenario is that the face of the Moon does not rotate about its polar axis as it revolves around the Earth, thereby maintaining a constant absolute orientation. This would result in observers at various longitudes on the Earth seeing different orientations of the features on the Moon's face relative to Polaris. Please remember, we are trying to determine the structure and mechanics of the known universe, not what spinning ceiling fan blades look like. Only careful observation and analysis of the heavens can provide that answer. I concur, and I'm of the opinion that one of the two possibilities suggested is the actual case. I've tried several times to get some decent pictures of the moon, but my old camera doesn't seem up to the job (focus issues, especially when clouds are near by). I'll head into the city over the weekend and try find myself a new camera, and if weather permits I'll grab some shots. We have a super moon coming up on November 15th too, which is probably an opportune time to capture these sorts of shots. Havent seen the moon over here (Central Coast) for a week or so, too much cloud (real and sprayed). Will definitely set up tripod and camera, with time lapse, for the super moon though as long as the sky is clear enough. I'm not the expert, couse i have not made my own observation but with knowledge i have at the moment i would say that Moon is rotating around the Polaris and his surface could be concave. 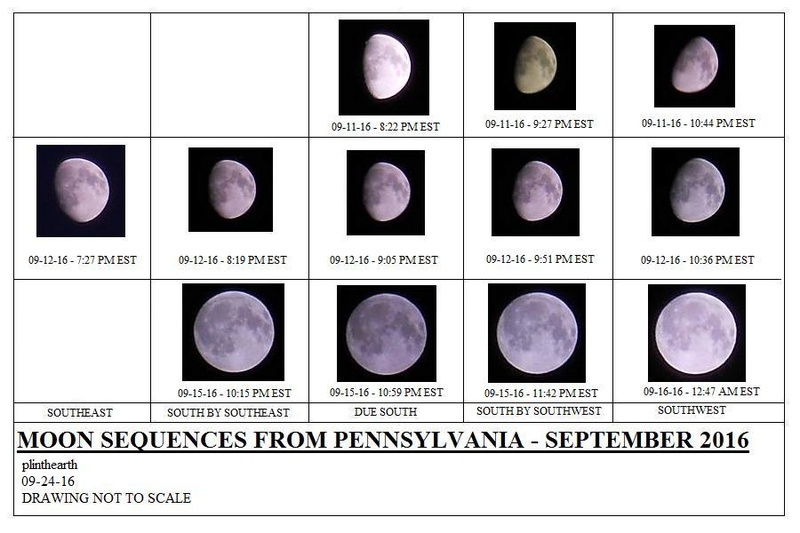 As the drawings "Moon Sequences From Pennsylvania - September 2016" and "Moon Sequences Analysis" clearly show, the face of the Moon does indeed appear to rotate clockwise around its center point as it crosses the sky to a stationary observer north of the equator. 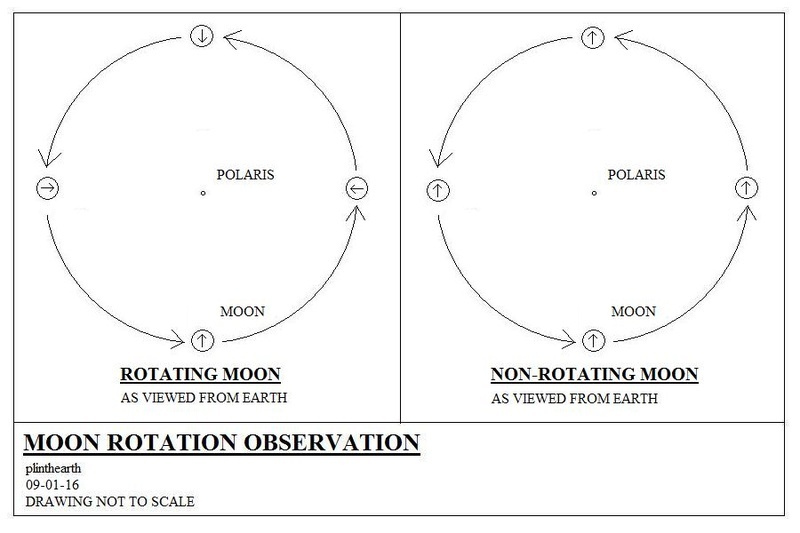 This apparent rotation is only possible if the Moon does not maintain a constant angle of its face relative to Polaris. If the Moon does maintain a constant angle relative to Polaris (like the ceiling fan blade analogy), it would appear to rotate counter-clockwise about its center point as it crosses the sky to observers north of the equator. This does not happen. The Moon appears to northern observers to rotate clockwise. The only way that this can be ascertained is by the comparison of documented Moon photo sequences from various longitudes across the Earth taken roughly at the same dates/times to determine the differentials. If done properly, this analysis could reveal not only the speed (or lack) of rotation of the Moon in relation to the speed of its orbit, but also the approximate size of the Moon and its distance from the Earth. I must also add that it is entirely possible that the circular Mercator projection model of the flat Earth is incorrect, and that the geometry of the flat Earth is more like an oval or perhaps even a rectangle. As far as I can tell, these images were taken from Ireland (53° N, 8° W). If so, I find it interesting that the orientation of the face of the Moon is roughly the same as what I see here in Pennsylvania (41° N, 76° W). Without documentation of the observation data, however, these images are not acceptable for analysis. I did this myself at work by just looking at the moon early in the morning, and for a few days from 4:00am to 4:30am in the western sky as it went down behind the mountains of southern Nevada. Sorry that I can't give you the exact days in August 2016. The moon was a completely lit up full moon as it went behind the western mountains from our location, and was moving very quickly. It wasn't just a stationary body in the sky. It was moving very fast. Once it touched the top of the mountains it was completely gone in 10 minutes. This was happening just as the sun was about to rise in the east. So then "why is it that the earth's shadow was not present on the moon?" I asked. (I kept thinking that I should been making a video but I didn't...) I asked myself and three other co-workers about this because I had to show somebody else what was happening right before us (on 2 different nights), and because most people don't pay close attention to anything around them. THE EARTH"S SHADOW SHOULD HAVE BEEN COVERING THE MOON EITHER PARTIALLY, OR COMPLETELY AS THE SUN WAS COMING UP IN THE EAST! But it wasn't...That is proof to me that things are not what we are being told they are. Hi this is my first post so don't give me a hard time with what I'm going to suggest haha. About been able to see the stars in the moon.... could it be possible that the moon is behind the stars? And when the light of the moon weakens the stars become visible?? Again just a thought! As the moon travels across the sky its brightness hides each star as it's passing by the star and would appear that the star is going behind the moon but really the moon would be in front of the star? Would this also explain why we see the blue of the sky on and in the moon at day time?